"The chopping boards that my grandma used inspired me to design this series of cutting boards," confides Guatemala's Victor Hugo Lopez. 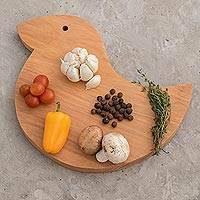 Working with pinewood, he carves the chopping board by hand in the shape of a duck. "The chopping boards that my grandma used inspired me to design this series of cutting boards," confides Guatemala's Victor Hugo Lopez. 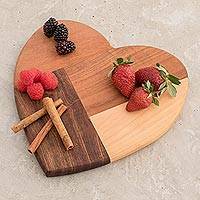 Working with pinewood, he carves the chopping board by hand in the shape of a heart. "The chopping boards that my grandma used inspired me to design this series of cutting boards," confides Guatemala's Victor Hugo Lopez. 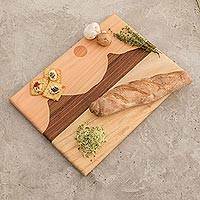 Working with pinewood, he carves the chopping board by hand. "The chopping boards that my grandma used inspired me to design this series of cutting boards," confides Guatemala's Victor Hugo Lopez. 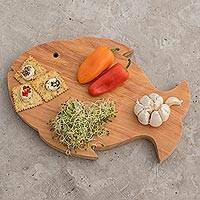 Working with pinewood, he carves the chopping board by hand in the shape of a fish. "The chopping boards that my grandma used inspired me to design this series of cutting boards," confides Guatemala's Victor Hugo Lopez. Working with pinewood, he carves the chopping board by hand in the shape of an apple. "The chopping boards that my grandma used inspired me to design this series of cutting boards," confides Guatemala's Victor Hugo Lopez. 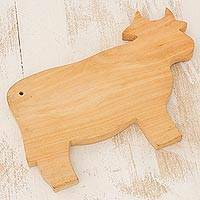 Working with pinewood, he carves the chopping board by hand in the shape of a cow. 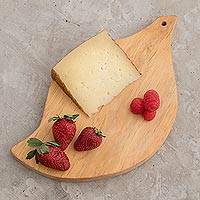 Featuring a handcrafted design from renewable cypress wood, this cutting board is presented by Guatemala's Patricio Coroy as part of a project to reforest the areas near his village. 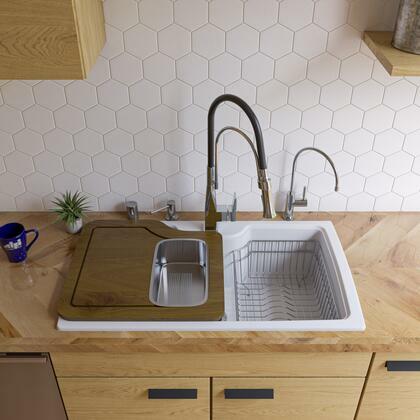 This sustainable and useful creation features a natural finish and a juice well. In the Mesoamerican Kaqchikel language, ki'kuxlaj is the word for harmony. Guatemala's Carpenters of Atitlan draw great inspiration from the indigenous Kaqchickel people as they create this artistic cutting board. 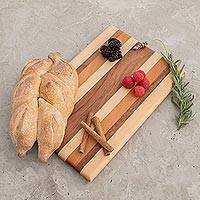 Lines of cypress and chechen wood alternate with each other to create a harmonious design over the surface of this cutting board. "The chopping boards that my grandma used inspired me to design this series of cutting boards," confides Guatemala's Victor Hugo Lopez. 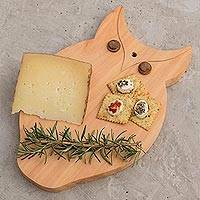 Working with pinewood, he carves the chopping board by hand in the shape of an owl with conacaste wood for the eyes. In the Mesoamerican Kaqchikel language, jech is the word for sharing. Guatemala's Carpenters of Atitlan draw great inspiration from the indigenous Kaqchickel people as they create this artistic cutting board. Pieces of cypress wood alternate with dark chechen wood to create a beautiful look. "The chopping boards that my grandma used inspired me to design this series of cutting boards," confides Guatemala's Victor Hugo Lopez. 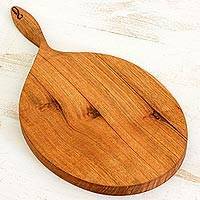 Working with pinewood, he carves the chopping board by hand in the shape of a pear. 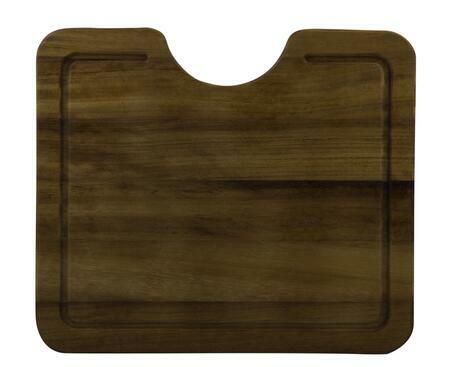 Designed by Guatemala's Carpenters of Atitlan, this cutting board will make a striking and artistic addition to your kitchen. The talented artisans work with cypress, cedar, and manchiche woods, each displaying its unique colors and natural grain. 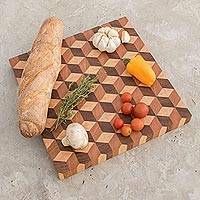 The wood is carefully cut and pieced together to create an illusory geometric effect over the surface of this cutting board. In the Mesoamerican Kaqchikel language, ka'i jux is the phrase that refers to parallel lines. Guatemala's Carpenters of Atitlan draw great inspiration from the indigenous Kaqchickel people as they create this handsome cutting board. 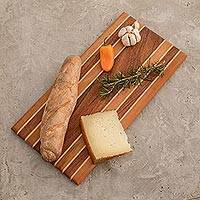 Parallel lines of cypress, manchiche, palo blanco, and katalox wood display their unique colors and grain along this cutting board's surface. In the Mesoamerican Kaqchikel language, q'uechelaj is the word for forest. Guatemala's Carpenters of Atitlan draw great inspiration from the indigenous Kaqchickel people as they create this artistic cutting board. Thick stripes of caoba and manchiche woods alternate with pinstripes of cypress wood, each displaying its beautiful natural color and grain. 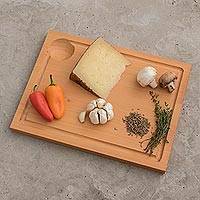 Functional but with a decorative aspect, this unique cutting board from the Rodriguez Family of Mexico is a stylish way to prepare ingredients for home-cooked meals. 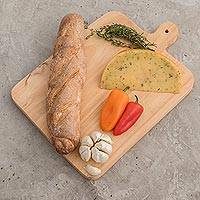 The Mexican artisans craft the rectangular cutting board from long-lasting basalt stone and give it a base made of pinewood. 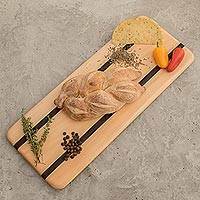 With the board's rich brown and grey textures, it will make you proud to display the culinary tool on your kitchen counter even when you're not using it. 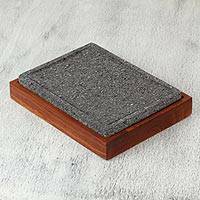 The base should be wiped with a damp cloth, but the stone board is washable. "The chopping boards that my grandma used inspired me to design this series of cutting boards," confides Guatemala's Victor Hugo Lopez. 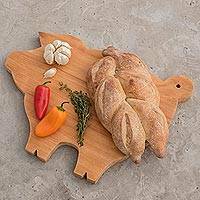 Working with pinewood, he carves the chopping board by hand in the shape of a pig. In the Mesoamerican Kaqchikel language, k'u'x is the word for heart and soul. 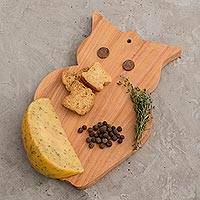 Guatemala's Carpenters of Atitlan draw great inspiration from the indigenous Kaqchickel people as they create this elegant cutting board. Pieces of tsalam, cypress, chechen, and coaba woods display their unique colors and grains, coming together to form the shape of a heart. 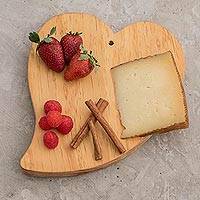 Inspired by Christmas, Guatemala's Carpenters of Atitlan design and craft this beautiful cutting board to add to your kitchen. 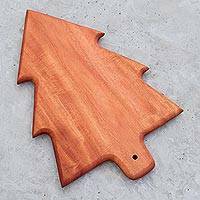 A single piece of caoba wood is hand-carved into the shape of a Christmas pine. 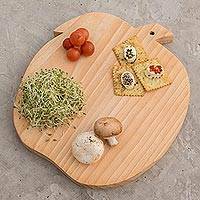 This cutting board displays the gorgeous colors and natural grain of the wood. "The chopping boards that my grandma used inspired me to design this series of cutting boards," confides Guatemala's Victor Hugo Lopez. 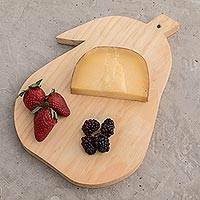 Working with pinewood, he carves the chopping board by hand in the shape of a leaf. In the Mesoamerican Kaqchikel language, ixkanul is the word for volcano. Guatemala's Carpenters of Atitlan draw great inspiration from the indigenous Kaqchickel people as they create this artistic cutting board. Pieces of cypress, manchiche, caoba, and palo blanco woods are all brought together to create this landscape, depicting two volcanoes beneath the rising sun. Nicaragua Carpenters design original kitchen utensils with a twist - literally. 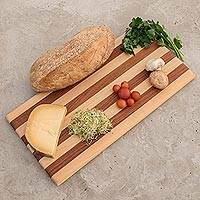 They carve the seasoned mahogany cutting board by hand, its rich reddish brown hue enhancing the original design with a slight twist at the bottom of the handle.This item can be washed by hand or put in the dishwasher; do not soak.